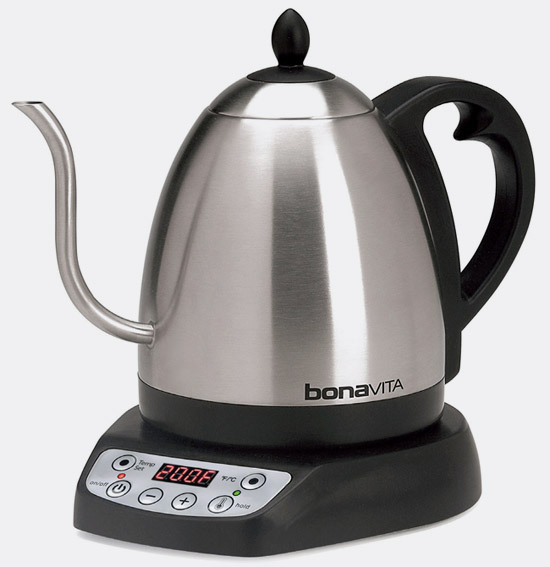 The Bonavita Electric Variable Temperature Gooseneck Kettle has quickly become a mainstay in making pourover coffee as well as tea. This cordless kettle gives you the precision and control that many kettles fail to offer, but still has simplicity at its core. The gooseneck spout makes pouring easy and accurate, while the pistol grip-style handle gives you balanced weight and safe handling. What sets this kettle apart from others is the ability to control the temperature and timing. The temperature can be set with 6 presets, or in 1 degree increments starting with 140° F. That means you can set the temperature of your water for coffee, or, for various types of tea. A hold button will maintain any temperature for up to an hour. Also included is a count-up timer for accurate timing of coffee or tea brewing. Model BV382510V. Manufacturer's warranty is one year.